You’ve all said it before “See, she gets it! She knows!” – you’ve said it about a stranger and you’ve said it about your own friends and family. When someone connects to your life in a certain way, in this case your life as a mom, you feel a sense of comradery. And that’s what this blog is about. Mama Knows is a line we can all relate to. It’s about coming together as moms and sharing with and supporting each other, because we know. We get it. We’re moms, and Mama knows! Mama Knows is a place where I can share with you the products, thoughts and tips that I use every day to accomplish being a mom. 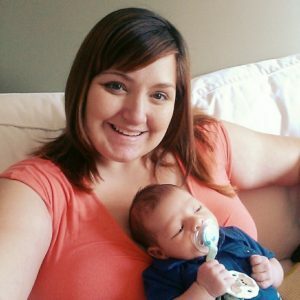 I’ll offer you reviews, parenting advice, articles and research- as well as fun giveaways and Hot Topics. And sometimes, I’ll just write. I’ll speak my mind and share my moments, good and bad. I’m Candace and I’m 35 years old. Quirky, independent, optimistically cheery, plump, loud, joyful, opinionated in some things, but thoughtful and open minded where it counts. I’m a mom who loves writing, cloth diapers, writing about cloth diapers, babywearing, my husband, my three sons, and my dog. I live near Calgary, Alberta but was raised on the West Coast. My husband is Mexican, and I’m slowly trying to learn Spanish. My oldest son, “C”, is 12 years old, “EJ” is 2 years old and “L” joined our family in October 2016. I hope that you can relate to my sense of humour, and I try my best not to take myself too seriously. If we all take ourselves too seriously, the internet is an overwhelming place. I should also add that I am in a wheelchair, but, even if you can’t personally relate to that, I hope it can at least help bridge some understanding between you and other moms of different abilities. Parenting from a wheelchair can definitely be a challenge but… just being a mom is a challenge. I don’t consider my role any harder than the average mama. We are all uniquely different, but we can all come together and learn while discussing one of our favourite topics: Motherhood! Moms all take different paths and approaches, but at the end of the day our children come first- and we love them with every breath.